Truthfully, it's no visit home to my parents in New Jersey without a visit to Del Ponte's Bakery of Bradley Beach. This old-school Italian bakery has cookies by the pound, gorgeous cookies and cannoli, and all sorts of fancy pies and cakes. They also offer fusion desserts, such as the Cannoli Cupcake, a cupcake with buttercream AND cannoli filling, topped with mini chocolate chips and crushed cannoli shell as garnish. Be warned: in my experience, the style of the cakes at Del Ponte tend toward slightly more dry (not because they're stale, just because it's more a style of cake meant to be paired with coffee), so definitely pair it with milk, tea, or coffee. Or do as my older sister did and just mainline the frosting and discard the rest (no, don't do that! It was just too sad to watch). 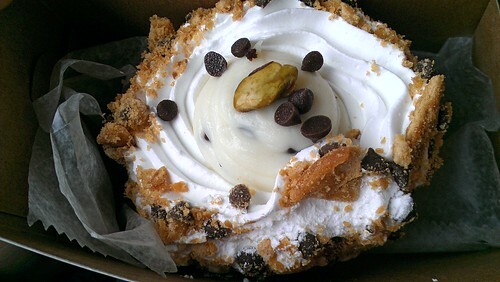 Cannoli cupcake: It's the most beautiful type of fusion dessert I can imagine. Del Ponte's Bakery, 600 Main Street, Bradley Beach NJ; online here.